Liam Richards/Saskatoon StarPhoenix The Prince Albert Raiders celebrate their game and series win over the Saskatoon Blades at the SaskTel Centre Sunday. 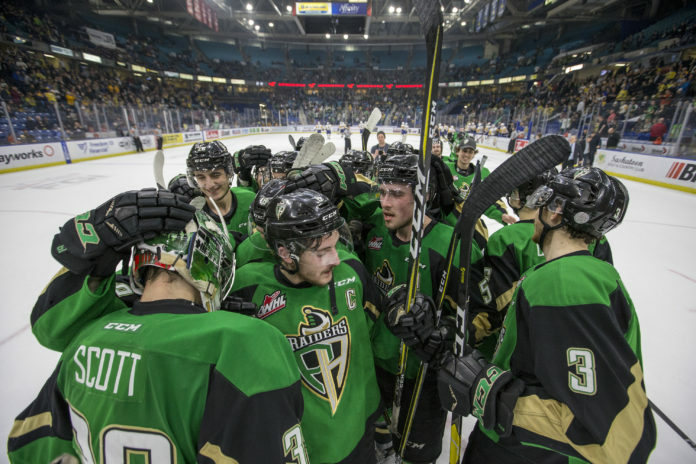 The Prince Albert Raiders are among the final four teams in the 2019 Western Hockey League playoffs. Thanks to a 6-3 win over the Saskatoon Blades at the SaskTel Centre Sunday, the Raiders earned a 4-2 Eastern Conference semifinal series triumph and will now play the Edmonton Oil Kings in the Eastern Conference final. As they did in Game 5, the Raiders came out of the gates strong on offence as they peppered Nolan Maier with shots and held the Blades to just four attempts on goal in the opening frame. “We want to come out with a lot of pressure every time we play and we did that the last two nights,” Kelly said. Raiders overager Dante Hannoun continued his hot streak as he recorded his first career WHL playoff hat trick and has scored six goals in his last three games. Noah Gregor and Brett Leason both had a pair of assists for the Raiders, who also got goals from Sean Montgomery, Aliaksei Protas and Kelly. Ian Scott made 19 saves for the visitors as he improved his playoff record to 8-2. The Blades were led on offence by a two-goal showing from Ryan Hughes, with Tristen Robins also finding the back of the net and Maier turning aside 26 shots. “We didn’t have a great start and we didn’t get enough shots on net today,” Hughes said. Despite the loss, it was still a successful season for the Blades as they reached the post-season for the first time since hosting the Memorial Cup in 2013 and won a playoff series for the first time in eight seasons with an opening round sweep of the Moose Jaw Warriors. “There’s a lot that the guys can take from this,” Blades head coach Mitch Love said. Next up for the Raiders is a Friday night clash with the Oil Kings at 7 p.m. at the Art Hauser Centre to start off their Eastern Conference final series. Tickets for Game 1 will be on sale Tuesday at the Art Hauser Centre box office at 9 a.m. and online at 10 a.m.
Hannoun’s three goal night moved him into a tied with Davis Koch for the playoff scoring lead with 14 points and into first place among goal scorers with nine. Sunday’s contest marked the final game for Blades defenders Dawson Davidson and Brandon Schuldhaus, along with forward Max Gerlach as all three players will age out of the WHL. With Cole Fonstad (injury) and Justin Nachbaur (first of a two-game suspension) not available, the Raiders brought in Cole Nagy to play up front for Game 6 as he made his post-season debut. The Blades did not dress goaltender Dorrin Luding, defencemen Alex Ozar and Majid Kaddoura, plus forwards Zach Huber and Colton Dach. 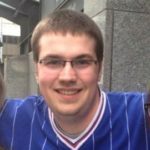 A crowd of 10,521 came to the SaskTel Centre Sunday, which was the biggest crowd for a WHL game in the venue since 10,030 came for the home finale for the Blades against the Raiders on March 17, 2017.